When most people think of NVMe SSD’s they think of high-end expensive drives that are incredibly high performance. Today we will be looking at something a little out of the ordinary and something aimed at the more budget-minded consumer looking to get a bit more out of his storage. 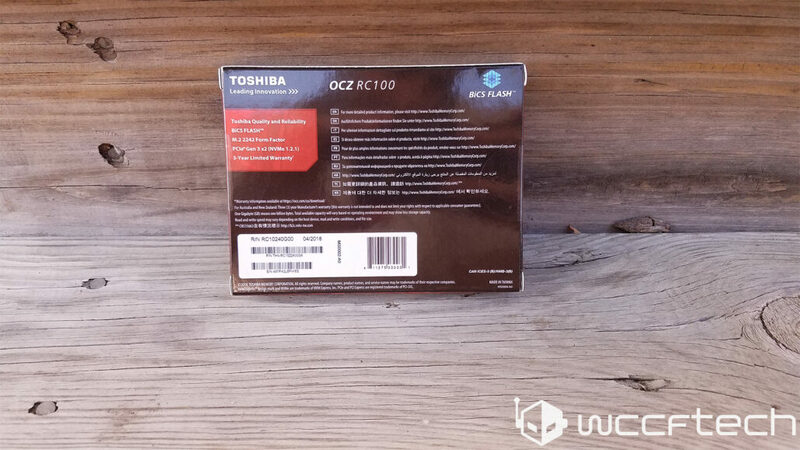 Today we will be looking at the Toshiba OCZ RC100 which is a DRAMless SSD but features something rather cool which may help make the difference in performance. 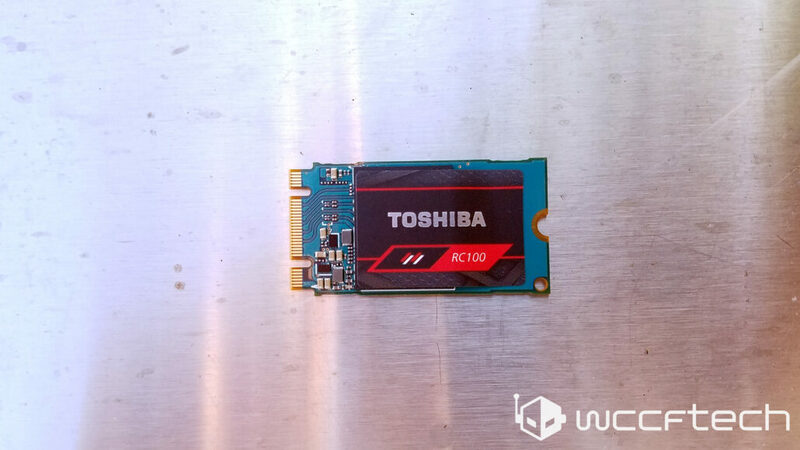 A new technology called Host Memory Buffer (HMB) Host Memory Buffer is a low level shared memory interface at the OS level that allows the Toshiba RC100 to access part of the DRAM for its own caching space in place of having memory on the device itself. By using the system’s DRAM it helps to improve IOPS performance significantly over fully DRAMless solutions and also will help lower the device’s power consumption as it is one less component to power, although this is at the cost of host system’s DRAM resources. (38MB in my case which is very insignificant) This is, by all means, a cost-saving measure, though pricing to the consumer is still quite good. This allows controllers to be less complex and cheaper as well as the cost of the DRAM itself. The biggest advantage in my mind is the size it allows and in this form factor options like NUCs, notebooks and ultra small form factor PCs are able to accommodate this drive. Looking at the box we see a very simple design with red and black as the color coding with a hero shot of the SSD on the front with the form factor, capacity, and interface. With the back, we see it has a 3-year warranty and is a PCIe 3.0 x2 device. Once it’s removed from its box it is in a clamshell plastic carton and is remarkably tiny and its rather impressive how small this entire package is. 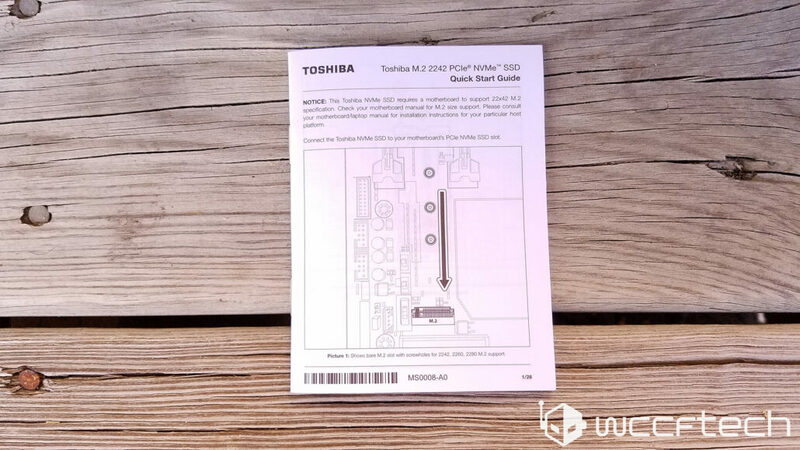 One important note is since it is only a PCIe 3.0 x2 device it can work as an M key as well as B+M key sockets so it is important to make sure your motherboard supports M.2 PCIe SSDs since SATA M.2 SSDs use the same interface. Your motherboard might support only SATA or PCIe devices in those slots and thus not work with one vs the other. I use a Ryzen test bench for my reviews, since most other websites test with Intel mainstream platforms, I personally think this is useful for all of those users who are using AMD’s Ryzen CPUs and AM4 socket motherboards to get a good idea on what kind of performance they should expect. 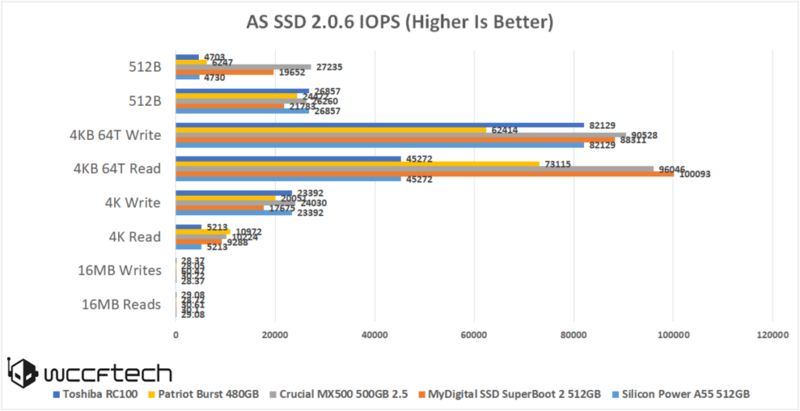 For this system, we have chosen to enable the use of HMB through the entire run of our bench suite, since 36MB isn’t a whole lot to lose for the performance boost. Crystal Disk Info is a wide tool for displaying the characteristics and health of storage devices. It will display temperatures, the number of power on hours, the number of times it has been powered on, and even informing you of the firmware version of the device. Here we see the usage on it and the fact its been in my system for over a week, as well as the temperature it gets sitting under a GTX 1070 after an extended gaming session. Please note that the drive was tested with the GPU in the 2nd slot, this CDI was taken AFTER benchmarking. Here we see the amazing performance of the drive in one of the lighter benchmarks you can see how blazing fast it is in everything except for the early writes though eventually, it starts flying ahead. 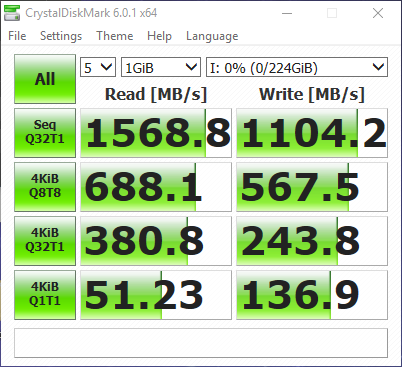 In Crystal Disk Mark we see a huge lead taken by the RC100 and performs as we would expect from an NVMe SSD by blowing everything else out of the water. though it doesn’t stay this way throughout the rest of our tests. 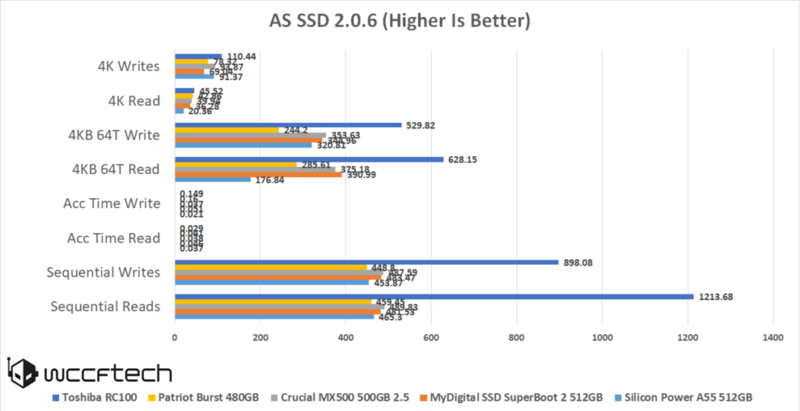 In AS SSD IOPS test you can see that the drive shows its weaknesses against drives that come with DRAM Cache like the MyDigitalSSD Superboot and the Crucial MX500 and it quite a poor performer here. 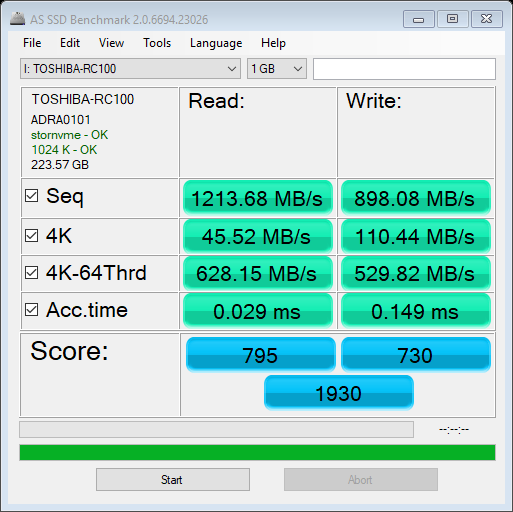 In the speed tests we see how fast the drive is in the sequential reads and writes, so is a solid performer in large file transfers, though its access time is really fast due to the NVMe interface and is the fastest in writing and reading at both 4k tests by a rather impressive margin. For real-world testing, we have decided to use Diskbench to move a large game directory (The Witcher 3) which comes in just under 43GB with a nice mixture of large and small files. We use this workload to simulate either a gamer moving the games of his primary drive to a secondary drive or someone moving large directories over. 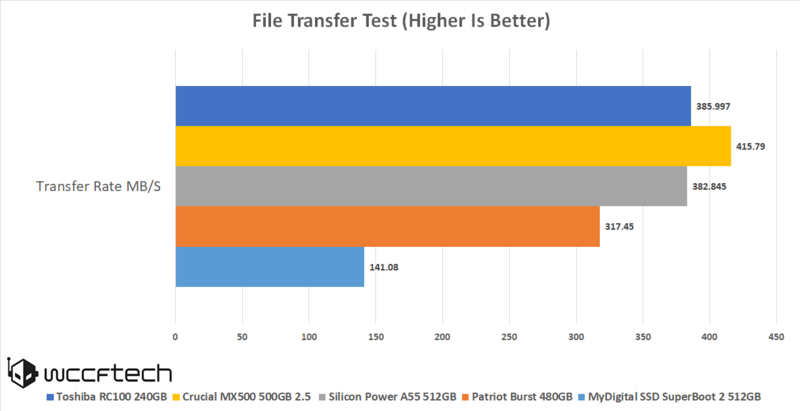 In our file transfer test, we see the high performance of the MX500 with the mixed file sizes though the Toshiba RC100 and SiliconPower A55 both do respectably at 380 MB/s. 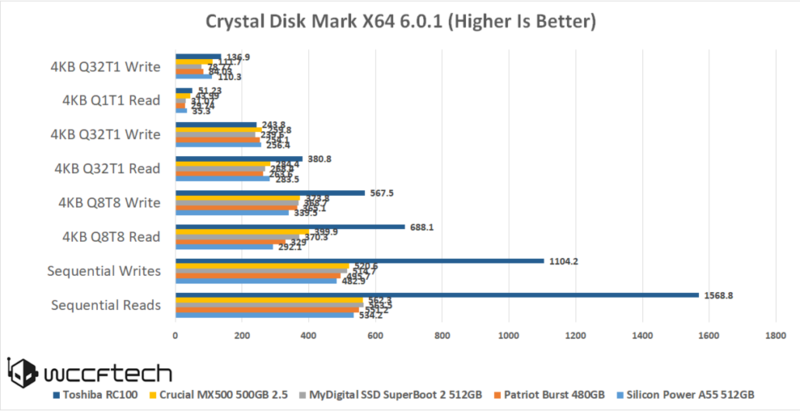 Though the MyDigitalSSD pushes 317MB/s with the Patriot Burst coming in last at 141MB/s. 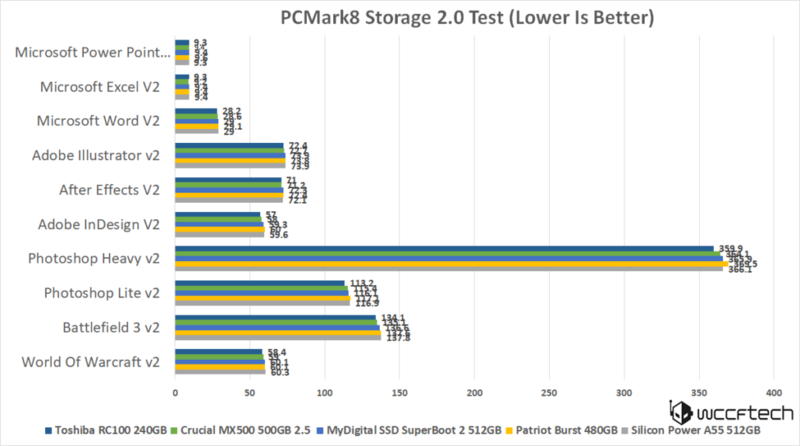 The PCMark 8 Storage Benchmark is used to create real-world testing scenarios that many users use on an everyday basis. With 10 traces recorded from Adobe Creative Suite, Microsoft Office and as well as Battlefield 3 and World Of Warcraft, the light to heavy common workloads have been represented. 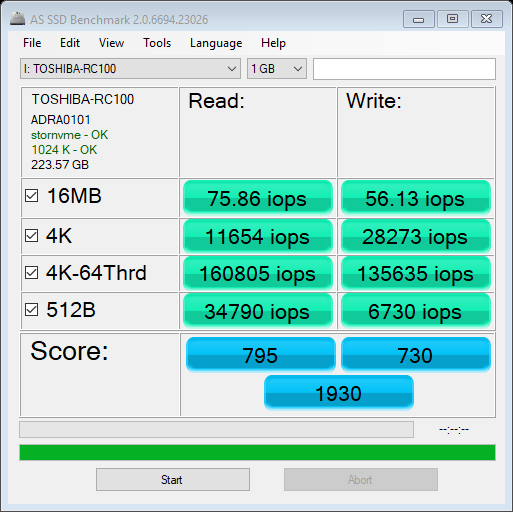 This is unlike other tests that it shows off real-world performance between storage devices. The higher the score the better the drive performs, and application tests are measured in seconds. The test has a break in the cycle as well as 3 rounds of testing. In PCMark 8 we see a huge performance difference in the average bandwidth and wins by a rather slim lead in the storage score. It takes a lead in just about every other application in the application tests as well. 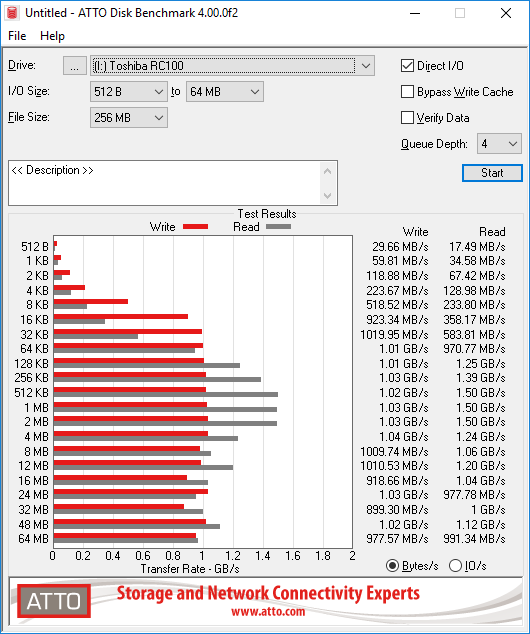 All in all, this is a rather impressive drive for its size and the HMB gave it some really solid performance. That being said when pushed to its limits it definitely shows its weaknesses. 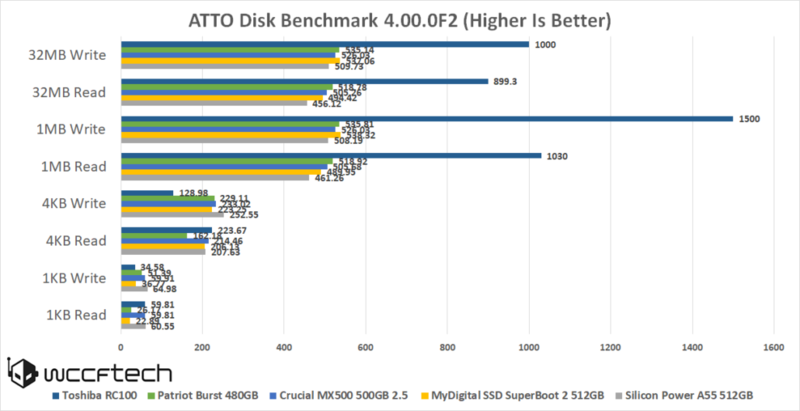 At least in my testing suite, Anandtech had a similar experience with their much heavier workloads, that being said this drive should perform pretty well compared to other DRAMless SSDs in its price point, but others have complained about its performance when the drive is near full which is something I may come back to with this drive at a later date. 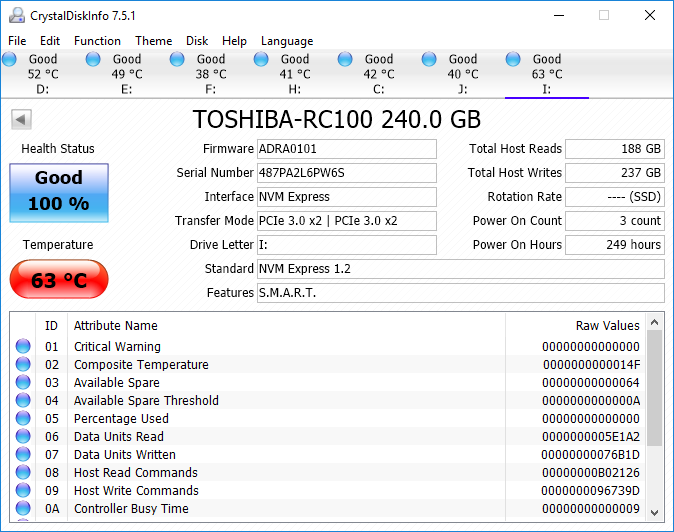 Its hard for me to give it an outstanding recommendation but for anyone who needs a drive in the 2242 form factor this is one of the few drives on the market and should almost automatically be your go to. 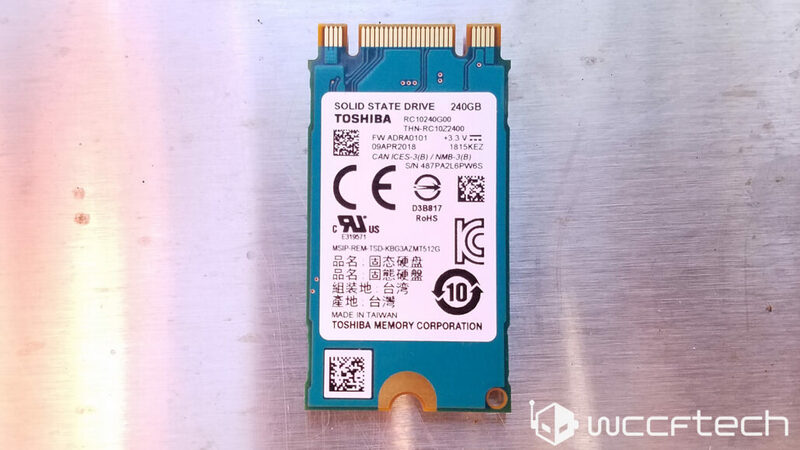 While it’s not the best drive on the block and is a great try by Toshiba, it leaves a little too much to be desired for it to be a home run. But for those on laptops or NUC type devices that can’t accommodate a 2280 M.2 drive, this is still a really solid option. 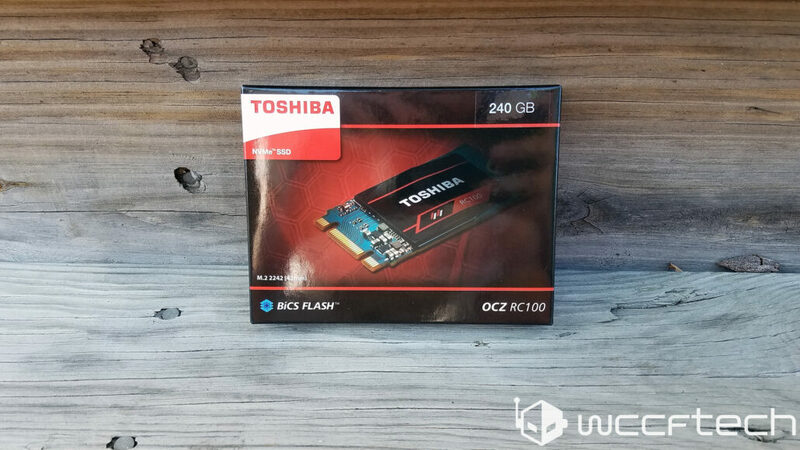 But just because it isn’t the best drive in its class doesn’t mean it by any means is a bad drive and at $80 should certainly be considered for an entry level NVMe SSD. 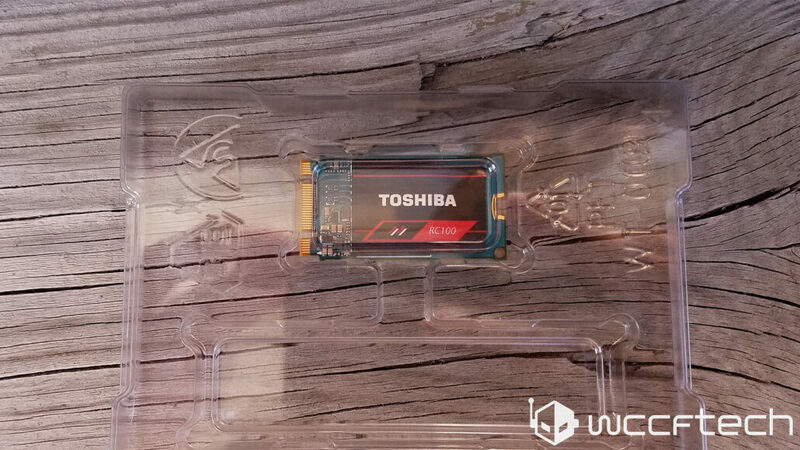 A solid try and the best thing available in its form factor, HMB is a really interesting technology and perhaps next time Toshiba will knock it out of the park.